Please Note: This merchandise page uses "Google Checkout." Only one item may be purchsed at a time. Thanks. 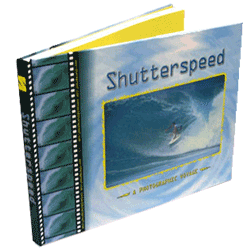 Spotlighting the core of modern surfing, Shutterspeed is an action-packed pictorial taking the reader on a wild and exciting ride through the lens of renowned action photographer and former professional surfer, Alexis Cottavoz. Some of the most awe-inspiring moments in surfing and extreme sports history are captured and preserved on the pages of Shutterspeed. After more than eleven years in the making, this dramatic photographic journal is destined to become a classic and vital chronicle of surfing culture. Originally from Santa Barbara, CA, Alexis Cottavoz-Usher recently moved to Los Angeles in 1998 to focus his energies toward becoming a commercial director. Finding it difficult to penetrate the agency world, he is now working with other independent talents to develop his own creative story boards. In the mean time, this collaboration between industry peers has lead to the production of a few short films, such as Apocalypse Knowels and Pure Funk. Cliche aside, Alexis is without a doubt the most passionate, motivated driven doer, don't take no for an answer, here to stay, outside of the box, creative directors to break into the world of professional film making. “Shudda Been Here Yesterday” is an action-packed pictorial spotlighting the essence of modern surfing. Renowned action photographer and former professional surfer, Alexis Cottavoz has captured some of the most awe-inspiring moments in surfing and extreme sports history. After more than eleven years in the making, this dramatic photographic calendar was shot in such locations as Hawaii. France, Bali, South Africa and Tahiti. Place this sticker on anything. Totally retro! It just grabs attention and so will you. Hey, it's our cool sticker and you can have one too.